Every fortnight, between the British Library and the St Pancras station, inside a wooden room in the ground floor of the Francis Crick Institute, four scientists discuss the present breakthroughs in science. Unlike other discussions happening in this room, this one will reach many other Spanish-speaking people around the world. We are talking about “En Fase Experimental”, the science podcast of the Society of Spanish Researchers in the United Kingdom (SRUK), where the team of hosts Teresa Rayon (The Francis Crick Institute), Berta Verd (Univ. of Cambridge), Cristina Rodríguez (Univ. 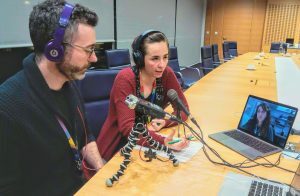 of Cambridge), and Ruben Perez-Carrasco (UCL), together with the sound technician Carlos Bricio, have the mission to discuss not only current advances in science but also the role and challenges that STEM research faces in the current world. In each program we interview a researcher actively contributing to the advance of science that provides their personal perspective. This season the program featured researches such as Sergi Castellano (UCL) expert in the extraction and computational analysis of ancient DNA or Javier Carmona (Springer Nature) discussing his new role as a editor in Nature Medicine. These interviews, motivate discussions on current challenges of science ranging from topics such as the impact and repercussion of winning a Nobel prize, to the relevance of open access science in developing countries. In addition, inspired by the work of Jess Wade (Imperial College), in each program we dedicate a section to narrate the rousing career of female STEM researchers such as the neurobiologist Rita Levi-Montalcini or the computational meteorologist Joanne Simpson. So if you want to participate in our discussions, or just want a excuse to learn Spanish, this is the podcast for you. You can find us in Spotify ,Youtube, iVoox, and in social media #EnFaseExperimental @ComunidadCeru.